The name Habans vas given to them during their stay in Slovakia as a popular name, by which the country folk called members of the Anabaptist „brethren courts“, i.e. settlements where the Habans lived. The word haban – as it was found out lately – is derived from the old Hebrew word ha-banim, which means true God´s children. Therefore, it was the name by which the Anabaptists originally called themselves as the members of the community based upon the principles of common property. The ideological roots of the Habans reach down to the period of the Reformation. They arose in Switzerland in 1524 for the first time, as a clean-cut religious-social movement, a sprout of the Protestantism, to the formation of which the Swiss reformer Ulrich Zwingli contributed to a great extent. He influenced the Habans so that they emancipated, creating an independent Church. Together with both reformers, Luther and Zwingli, the members of the new faith expressed dissatisfaction, asserting that though the Reformation had brought relief in the question of the faith and the Church, it had not brought a social liberty from the material oppression of the feudalism. In 1524, when the adherents of the new faith asked the city council in Zürich to be allowed to cal a public disputation on which they wanted to present themselves as a new Church, the city council asked them either to call of their „errors“ or to leave both the city and the country. The followers of the new faith had differed from the general current of the Reformation also by their conception of the Christian baptism of children that was considered to be a „unuseful wash of the new-born child“. They proclaimed only the baptism of adults to be valid. That is why they were called Anabaptist. Though they had protested against that name, asserting that they did not preach two baptisms, only the one of the adults, the name Anabaptists hat remained to them. In spite of the fact that the accusation of the baptism of adults had not been decisive, it had served as a main cause of the persecution of the Habans who were expelled from one country to the other so that they soon appeared in South Germany, Bavaria, Austria and, in Italy. According to the feudals lords, their relation to the property was their main sin. The Anabaptists had rejected private property. Its social function, service to the whole society was the only use of the property. Also their attitude to the authorities and to the payment of taxes would provoke rage. They refused to pay taxes, reasoning that the state abused the Money to lead wars. They had acknowledged no authorities, neither religious nor secular. Their preachers, servants of the Word, were chosen by them on public meetings. They were then their spiritual and secular leaders and administrators of the communities. By the fact that they did not acknowledge authorities and refused to pay taxes, they were evoking hatred of the state which, from the very beginning, gave out strict orders to exterminate the new religious –social movement, threatening to burn its members. All that led to their escape from their native countries and, in 1526, they are found in South Moravia, know at that time as the country of the religious freedom. Having been allowed by lords of Lichtenstein, they settled on their properties in South Moravia, mainly in the environs of Mikulov. Balthasar Hubmaier from Friedberg (that is why his Latin nick-name was Pacimontanus), the former priest in Waldshut in Bavaria, a learned doctor of theology, was the leader of the first group. Hubmaier had gained favour of the Lichtensteins. With their permission he called the printer Simprecht, called Froschauer, from Zúrich, he established a printing office, wrote a tract on the new faith, had in printed and amplified. He had a great success. About twelve thousand followers of the new faith gathered soon around him. It was a challenge to the old Church. Hubmaier was cited to come to Vienna to be held responsible. As he had not retracted his doctrine, he was burnt in 1528. Thus the persecution of the Anabaptists began also in Moravia and had lasted for years. Hubmaier had belonged to the moderate wing of the Anabaptists. He was prepared to tolerate secular order as an inevitable evil. The more radical wing of the Anabaptists, represented by Hans Amon, the leader of Low Austrian Anabaptists, proclaimed that a „Christian-believer may own nothing“. For these opinions there had come an ideological division in the community of the Anabaptists in Moravia even before Hubmaier was arrested. The followers of the moderate wing had stayed on the Lichtensteins´ properties in the environs of Mikulov. The radical wing, led by Hands Amon, moved to Slavkov. Yet, not later than in 1533, there came a division also in the community of the Anabaptists in Slavkov because, „many of them pursed sensuous freedom“and, „others had insincere hearts“ and, enriched themselves to the detriment of the community. The malcontents invited a reputable head James Hutter, native of the small South Tirol town Moso (in Italy), to Moravia to bring order to the community. Hutter came there also because the territory in Austria was already dangerous for the Anabaptist. He had settled in Moravia as the first Anabaptist head, a bishop of the Anabaptist Church. He vehemently stood up against all who were misapplying the confidence of ordinary members of the Anabaptists community, who were breaking the provision about the common property and were enriching themselves. He expelled them from the community and forbade any, even the smallest private property. By this radicalism, Hutter set all the authorities ion him, so that the emperor orderer to arrest Hutter and to judge him. Hutter manaded to escape, left Moravia for Tirol where he was arrested in the end of the year 1535, was condemned to death by burning and, was put to death in public in February, 1536. After his death, a systematic persecution of the Anabaptists began in all Austrian countries where the Anabaptists were living. The decree of the Znojmo assembly from 1535, even before Hutter´s return to Austria, ordered to banish the Anabaptists from Moravia. The expelled Habans started to settle in settlements of Western Slovakia where they had stayed for a short time but, in a year´s time they were again accepted in Moravia. They had lived in Moravia still ten peaceful years while the sovereign was busy with the war with the Turks who had settled in the old Hungary in the 16th century and, occupied a part of the country for which the Vienna sovereign put in a claim. After the situation had eased, the Anabaptists were again expelled from Moravia, in 1545. The Habans then settled in several settlements of Western Slovakia, mainly on the demesne of Francis Nyary as Sobotište, on the demesne of the Czobors and Peter Bakič in the settlements Holíč, Kátov, Šaštín, Bordské, Sekule, Moravský Ján and other ones. Since then, the Haban settlements in Western Slovakia had not been abolished. Within the years 1546 till 1620 the Habans built twenty-three brethren courts, i.e. common Haban settlements in Western Slovakia. The most significant were the Haban courts at Sobotište, Brodské, Moravský Ján and, at Veľké Leváre. Across those Haban courts, about twelve thousand expelled Habans from Moravia flew from Moravia to Slovakia in the years 1620 and 1621, after the uprising of the Czech nobility had been suppressed and the Habans had been for ever expelled to look a new home and motherland in Slovakia. A part of the Habans, about two hundred persons who had settled in Vadovce near Nové Mesto upon the Váh, went to Transylvania in 1621 after they had been invited by the Transylvanian prince Gabriel Bethlen. They settled on the prince´s lands in Alvinc (Vintul de Jos) near Alba Iulia (Rumania). Another group of the Habans of hundred and fourthy-five persons, who had moved from Moravia to Častkovce near Čachtice, settled on the lands of the prince George Rákóczi at Šarišský Potok, having been invited by him. But, when the Rákóczys abandoned the calvintistic faith and returned to the Catholic Church, the Habans had to leave Šarišský Potok. They left for Alvinc to their brethren and settled there. Yet, at the beginning of the 18th century, Transylvania was no more a free principality and became a part of the Austria-Hungary monarchy under the rule of Maria Theresa. During the movement of the re-catholization and, under the pressure of the authorities, the Habans began returning to the Catholic Church. A part of the radical Habans moved to Valachia (Rumania) whicht was under a Turkish yoke at that time. They had stayed there for three years but, already in spring of 1772 they started to move also from there. They went to Ukraine where they helped by the tsar marshal Peter Alexandrovič Rumiantsev to settle on his lands. His sobriquet of honor was Zadunaiski (it means Across the Danube – because he had crossed the Danube and defeated Turks). On his properties at Vishenka, the Habans had spent nearly thirty-two years. After the death of the count Rumiantsev, they settled on the lands of the Russian tsaar in South Ukraine, near Melitopol. They bad built several settlements and took up handicrafts and agriculture. In 1874, when the Russian tsar introduced conscription for all the inhabitants of the country and the Habans were afraid of the imminent enlistment which they were refusing, being resolute antagonists of the violence and wars, they had no other chance but to leave the tsar´s Russia. So, in 1874, they moved from Russia to the American continent and settled in the USA, near Great Lakes, in South Dakota and in other places. Till 1917, they had lived well in the USA but, when the USA entered into the war against Central Powers in the same years the Habans obtained summons to join the army. Then they decided to leave the USA for Canada. Till the end of the Great War they moved to the states of Alberta and Manitoba where they have lived so far. Yet, a part of the Habans has stayed in the USA. 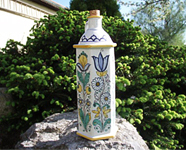 Within 1620-1677 the faience was produced only in Slovakia. 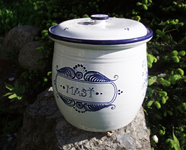 After 1677, former Haban masters begin to move from Slovakia to Bohemia and Moravia to introduce there faience production which was a great fashion in the whole Europe. When founding workshops for the production of the faience in Moravia and Bohemia, the best specialists were former Haban masters, then already catholicized. They were from Veľké Leváre, Malacky, Skalica, Sobotište and from other settlements in Western Slovakia. 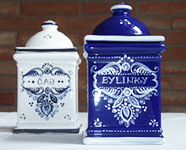 Delft influence is known by the Europeanization of China decoration, by imitating the decoration of China porcelain imported to Europe through Holland. There, in the town Delft, China porcelain was imitated in the local production, the decorations of which have extended to the whole Europe.